It's a good thing I quite like making these hourglass blocks, as that's pretty much all I've been doing. I've sewn one column of slightly bigger hourglasses down the left-hand side of my starter piece, but other than that I've just made the three bits you can see in the picture, plus a pile of odds and ends that haven't yet turned into something bigger. When I get tired of hourglassing I sit and ponder, and shuffle things about. Looking on bright side of things, I am still working with the floral fabric; there was more in that blouse than I thought. I am hoping that I can keep going at this, albeit it slowly, and also get my head around this quarter's AHIQ challenge. I guess we'll have to see how that goes! This is so interesting to watch. As you put more bits down, I can see places where I'd add fillers, too. I may grow up to be more like you some day. Ha. You're going to be able to make hourglass blocks in your sleep! Do you ever wake up at night with a design idea? I do, then I write it down or draw it so I don't forget it. Then I look at it again next morning, sometimes a keeper, sometimes just a crazy dream. I'm interested to see what you come up with in the space between the "9 patch" hourglass blocks on the left and the main centre section! perhaps your words for this one should be "sit and ponder" and "shuffle things about" - worked into one of the linear bits that you are using to subdivide the hourglass blocks. I'm glad to see you adding more purple. 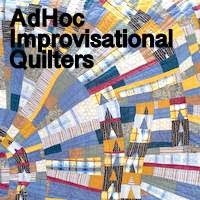 It really gives the quilt a sweet character, like violets. It's amazing how far you can stretch fabric from clothing. I look forward to seeing how it evolves as you start to add more fabric.